Impressive technical knowledge, managerial skills, entrepreneurial farsightedness. These, in our opinion, are the cardinal qualities explaining Gianfranco Rizzardìs success. 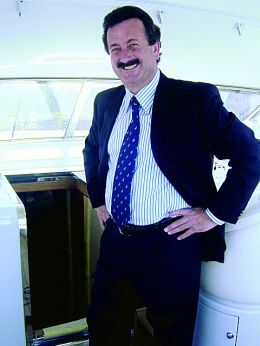 Rizzardi, given his total involvement in the management and growth of his shipyard, is an almost elusive figure even for a "bloodhound" journalist. He is a zealous worker, dividing his time between production (he is personally involved in the choices made, in the search for technical solutions, in the progress of boats in production and in the design of new models), meetings with dealers and customers, administration, endless trips to the world's major trade fairs, promoting his boats with specifically conceived, ad hoc initiatives. And as if this wasn't enough, there is his involvement in pleasure motorboating, following the lives of his boats and his sons, who sail them, in the various stages of world championship endurance races. His visceral love for his work, for the sea and for the beautiful craft that sail on it has led the Rizzardi shipyard, with its open cruisers and its Posillipo brand, with its flys and superyachts, to horizons that would be unthinkable to others. You have successfully made a name for your motor yachts in an extremely difficult context, one in which national and international competition is fierce, especially because most of the players are large, international shipbuilding groups. What is the secret? We are a small group, if it can even be called a group, and one might say that we are the "haute couture" of the market. A ready-made garment, or worse, is one thing; a tailored garment is another. We have focused on quality and on the customer. Our customers choose the details with us, they participate in the creation of their own yachts, right here in the shipyard. This means that, since the beginning, we have also invested significantly in technological research and innovation, and we continue to do so with utmost professionalism. And then, we first of all establish an amicable relationship with our customers, creating the trust that, for us, is essential. Last year, during the Cannes Salon, you presented the first super yacht over 100 feet. How did the market respond to this debut? It was quite the undertaking, I might even say challenge, and a great success. The market has undoubtedly responded with great interest to our "Technema 105'". I could tell you about the requests we have had... but I would prefer to point out that it was those of you from the specialised press that showed great "curiosity" about our boat, and your very positive comments contributed to making the product known and appreciated. With respect to a medium-sized fly motor yacht, what basic differences have you found in the design and building of such a large boat? We did not encounter any particular difficulties at the design level, the "Technema 105" followed the same cycle that is normally used for other, smaller boats in our range. On the other hand, there were some logistical problems, such as the physical space in which to build the boat, and all of the outfitting and launching operations for such a large craft. Even the transport of a boat of this size is a challenge, and for this reason, I recently acquired our new premises in Fiumicino. Was the "Technema 105 " created solely in-house? Yes, certainly, this has always been our prerogative, one which we wanted to keep, even for the flagship. The boat's engineering was also done by us, by the shipyard's designers. For me, this is an essential part of our work. Was it necessary to adapt your production facilities and, if so, in what way? As I mentioned, I invested in Fiumicino in order to acquire a shipyard with access to the sea. In my opinion, this facility is particularly strategic precisely because it opens up new growth perspectives for our firm's future flagships. 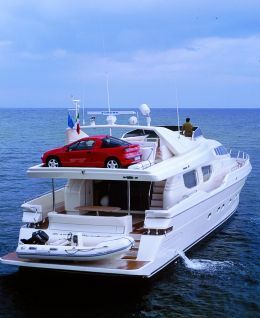 What, according to you, is the ideal business strategy for selling this type of boat? The shipyard's gradual growth has gone hand-in-hand with the growth of our projects and the reorganisation of the sales network. 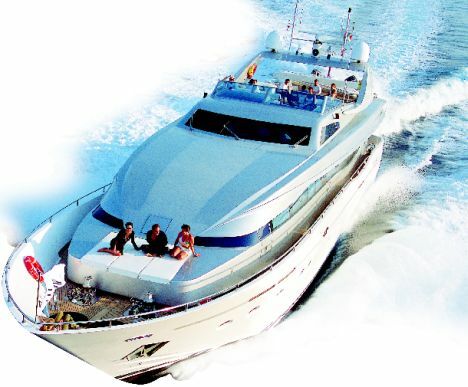 Then, it has been very important to participate in the top nautical salons for pleasure boats, which are excellent international sales windows, offering an opportunity for comparison with our various competitors, which in turn stimulates us to continue to improve. What pleases you the most about the "Technema 105'" and what, on the other hand, would you improve? How and when will you expand the range of Posillipo superyachts? As it happens, that is what we are now doing. In the shipyard, we are building the first of the new "Technema 95's" and we expect to deliver the first of these completely original super yachts before the end of the year. For a shipyard, extending its product offer, making it more varied, means knowing how best to respond to customers' various requirements, chosen from among a wide range of high-quality possibilities. For us, our customers are our point of reference. With the Rizzardi brand, on the other hand, you recently presented a new flagship, the "CR 73 Top Line". When will we see a Rizzardi open super yacht? This is something else that we are currently working on. An ambitious project, but, for us, it is essential to find new challenges. "Step- by-step" has always been the Rizzardi shipyard's motto and, in this case as well, we are respecting this philosophy fully. We are putting a lot of effort into the project. At the present time, all I am at liberty to tell you is that we are working on a "Cr 110".